We're following that post with a series of short profiles that will collectively provide a starting point for an exploration of international blogs, online magazines, and pages. We began by looking at Kilele, We Take Pictures Too, Arab Image Foundation, Greater Middle East Photo, Space Cadet, Street Level Japan, Kantor Berita MES 56, Japan Exposures, Invisible Photographer Asia, my new notebook, and oitzarisme. Today we continue with Guatemala-based La Fototeca. In a sentence: One of the online heavyweights in Latin America, La Fototeca runs a wide variety of posts in both English and Spanish on contemporary photography. 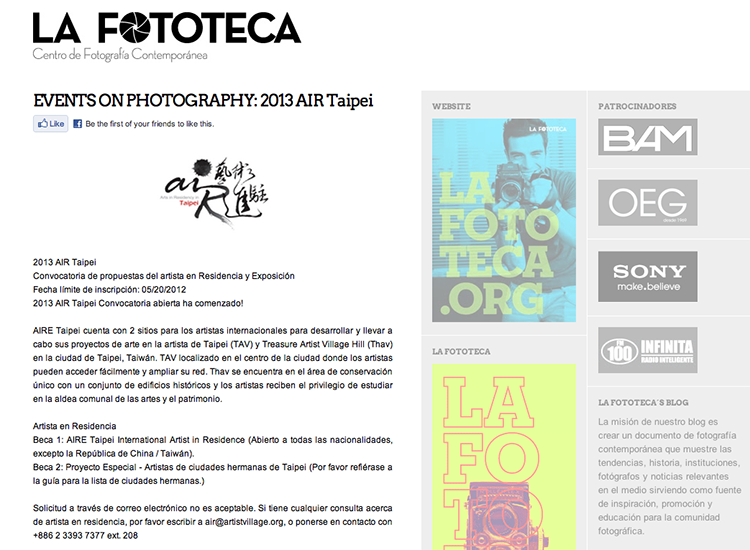 The blog is just a part of the larger mission of La Fototeca, an institution founded in 2009 that includes educational programming, lectures, workshops, and an inspiring headquarters in Guatemala City. The blog aims to create a document of our current photography world as an educational resource. Wide-reaching posts cover news, events, photographer portfolios, institution profiles, and more. The posts are internationally oriented, with a slight emphasis on Latin America. Their sidebar has an impressive list of links for further exploration. La Fototeca can be found on Facebook and followed on Twitter.